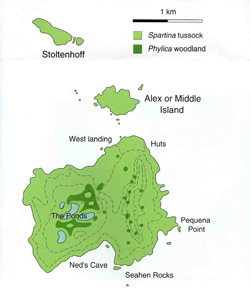 Uninhabited Nightingale includes the islets; Alex or Middle Island, and Stoltenhoff Island. Tristanians visit to gather seabirds' eggs and meat, and guano fertiliser. The island was first named Gebroocken (Broken) Island after its rugged profile by the Dutch Nachtglas expedition in 1656, and later named Nightingale by the British Captain Gamaliel Nightingale in 1760. Nightingale is the oldest of the three main islands, with recorded volcanic rocks from 18 million years to 360,000 years old. The island group is only a small remnant of a much larger active cone. The main island is only 2.5 x 1.5 km and has an area of about 3.2 km2. Its highest point, High Peak, is about 370 metres (1200ft high). North of the main island lie Middle or Alex Island, and beyond Stoltenhoff Island ( named after the German Stoltenhoff brothers who attempted to settle on Inaccessible island in the 1870s). Numerous sea stacks lie off the islands. This view looking south, is looking across Middle Island, with the easterly tip of Stoltenhoff Island to the right. Traditional wooden framed boats with canvas skins and sails (left) have been replaced with modern fibre glass boats with nylon sails (right). Today Nightingale trips are also made by powered boats, including the search and rescue boat Atlantic Dawn. Islanders undertook hunting and gathering trips to Nightingale (for sea bird eggs and meat) when it replaced Inaccessible as the most often visited island in the late 19th Century. 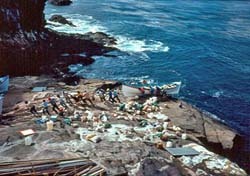 The steep, but smooth, rocky landing point on Nightingale is a busy scene as a longboat convoy arrives on the wilderness island. The light boats are hauled to safety and secured under low sea cliffs away from ocean swells (but during the 2001 hurricane 40% of the camping huts above the cliffs were destroyed!). Incoming cargo includes essential fresh water (there is no good drinking water on Nightingale due to interaction of seabirds in the peat soil! ), potatoes and building materials for mending camping huts. Outgoing cargo may include sacks of penguin guano, gathered in January or February for use as potato fertiliser, eggs of penguins or shearwaters and meat and fat obtained from mature young great shearwaters traditionally hunted during the May 'Fatting Trip'. This view from the summit of High Peak looks down to an area of Spartina tussock grass just above the landing. Beyond are, first Middle or Alex Island, and beyond Stoltenhoff Island ( named after the German Stoltenhoff brothers who attempted to settle on Inaccessible island in the 1870s). All the Nightingale Islands are also surrounded by numerous rocky islets or sea stacks. 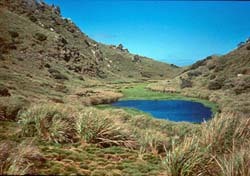 The tussock grass dominates the islands and grows over 2 metres tall. It is highly abrasive and long sleeves are advisable, even in high summer. The rich vegetation has rotted down over the centuries into thick layers of peat which overlies all except the steepest ground. Islanders have built paths (called 'roads') to travel inland which are visible below. Islanders more modestly refer to the three inland lakes in central Nightingale to 'Ponds' . The only Tristan island tree, Phylica arborea, grows in thickets in this central area and gives shelter and food to the rare land birds. Wood is cut for firewood for use in cooking by islanders. 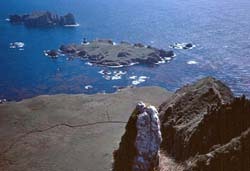 The central valleys contain many nesting sites for the Atlantic Yellow-Nosed Albatross, whilst the Sooty Albatross is more likely to favour higher and steeper sites on the ridges above. The peat soil below is honeycombed by the burrows of literally millions of breeding sea birds - especially the Great Shearwater, known as the Petrel by islanders. Endemic to the Tristan group, these birds number up to 4 million on Nightingale alone, and will nest on the land surface when no new burrow sites are available.